We know that there are many materials out there that your company can use. Our materials are developed specifically with tutors and educators in mind. What sets Test Prep Works above the competition? Test Prep Works, LLC, offers customized versions of our SSAT and ISEE materials. Schools, learning centers, and other organizations can choose from three levels of customization to create the materials that best fit their curricula. A basic level of customization is available with no setup fees. Read below for more details. For more information, fill out a contact form or send an email to sales@testprepworks.com and we will gladly discuss your individual needs. Customers can choose the level of customization that best fits their programs and budgets. 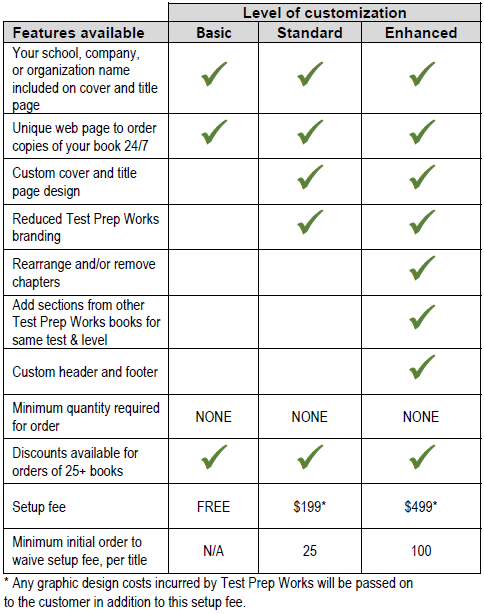 The basic level puts a customer’s name on the cover and title page for no setup fee. With a unique web page to order copies of the book and no minimum quantities, this is the most accessible level of customization we offer. The standard and enhanced levels give customers greater flexibility to customize the cover with their own PDF files, templates provided by us, or custom designed covers (additional fees apply). Customers have the option to reduce the Test Prep Works branding. The enhanced level of customization allows customers to make certain changes to the interior of a book as well, including customizing the header and footer, removing chapters, reordering chapters, or adding chapters from another book we offer for the same test. With the standard and enhanced levels, a setup fee is charged upfront that will be credited back if the first order placed for that title meets the applicable threshold. Q: What is the catch with the free basic customization offer? A: We hope that you’ll become a loyal customer based on the strength of our materials and the benefit of having your name on the cover. There is no catch. Q: How much does each copy of a customized book cost? A: The cost of a customized book is the same as the list price of the corresponding book available through retail channels. (Please note that some retailers may choose to offer a discount from the list price, in which case the price you pay for a customized book may be slightly higher than you would pay for the un-customized version.) If a customer would like to change the interior of a book such that there is no corresponding book available through retail channels, we will quote the price of the book prior to billing for the setup fee. Q: What do you mean by “Reduced Test Prep Works branding”? A: If a customer wishes, we will remove any pages that advertise our other materials, as well as most other mentions of Test Prep Works. We will always maintain our copyright notice, and we recommend keeping any references to useful resources on our web site. A: Fill out a contact form or send an email to sales@testprepworks.com. We’ll follow up with you to answer any questions and then walk you through the easy three-step process of 1) choosing the materials to customize, 2) creating the custom elements, and 3) placing your initial order. Q: What if I don’t know how to create a cover file? Q: What if I DO know how to create a cover file? A: That’s not a problem either. We can give you the required specs and then use the file that you provide. Q: Why should I bother with customization? A: Our customers find customized materials to be valuable for a variety of reasons. For some, it is about branding. Customized materials provide a valuable way to extend your brand experience and facilitate word-of-mouth referrals. For others, it is about tailoring the content to fit their programs. A: Call us. E-mail us. Fill out a contact form. We are here to help!